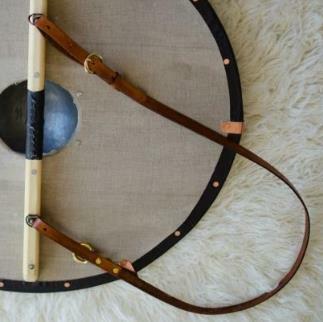 This sturdy Viking Shield comes stained on both sides in red oak. Grooves are cut into the plywood to create the illusion of planked construction. Shield is cut from 1/2" plywood which is actually about 7/16" thick. 14 gauge steel hammered boss is riveted on. Handle is cedar and riveted on. 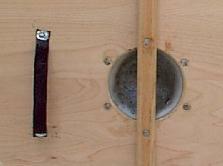 Rim is natural rawhide and is nailed on with copper nails and clinched on the back. 28" diameter. Weighs about 7.25 pounds. If out of stock it usually takes us about a week to make and ship. Great shield and nicely made. Very light and sturdy. Super fast shipping and great customer service. Would highly recommend this shield and company.